You are here: Home / News / The Greatly Anticipated Book ‘This Man’s Wee Boy’ To Hit The Shelves. The Greatly Anticipated Book ‘This Man’s Wee Boy’ To Hit The Shelves. Tony Doherty’s debut book, This Man’s Wee Boy, will hit the shelves on Wednesday 10 August. 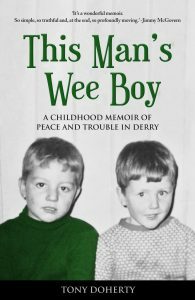 The greatly anticipated and hugely compelling story of Tony’s early childhood in Derry from 1967 to 1972 is told through the eyes of an inquisitive and thoughtful boy growing up in a city on the brink of civil war. The book tells the story of his working-class Catholic family, the onset of civil strife in Derry with the arrival of British soldiers, CS gas seeping into family homes and tracer bullets flying by windows. Described as “At times laugh-out-loud funny and heartbreakingly sad”, Tony’s young life unfolds in a story that beautifully captures the innocence of childhood, the dynamics of family life and street friendships. At the centre of the book is Tony’s father Patrick – a legend in the eyes of his son and a man who struggles to raise his family through the bitter years of economic inactivity in Derry in the 1960s and early 1970s. The book beautifully and movingly portrays the relationship between young Tony and the father he adores and slightly fears as events unfold, both within the family and on the streets of Derry. Violence eventually finds its way into Tony’s life through the death of a school friend under an army truck and then in a life-changing way when his family is ripped apart on the afternoon of Sunday 30 January 1972. In one of the most original memoirs of childhood, This Man’s Wee Boy is the story of a boy’s future changed forever when a civil rights march ended in murder on the streets of Derry.